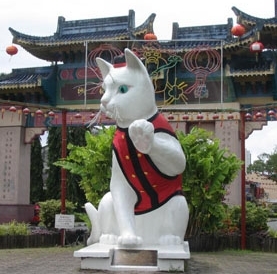 I'm back at home in Kuching for CNY. Part of the perks of being a teacher is a longer holiday. So I'm going to spend it wisely. First, I'm going to help out with the cleaning & all the other preparations. Then, I'm going to go shopping for new work clothes. I dont think it'll be wise to wash my G2k & Seed in the untreated water I get at school. All the while, I hope to recover from this fever that I brought back from school. It was a parting gift from my generous housemate. Because I deserve to & I need to. I have built up some tension from my first 2 weeks at school & this annoying fever. During the first 3 days of CNY, I will visit relatives & friends. 1st day: Strictly FAMILY. 2nd day onwards: friends but family is higher priority. During the next 3 days, I will finish the heaps of work I so responsibly brought all the 1000km way back home. Apparently, there is a law that states that teachers are allowed to be overworked even during the holidays (FICTION). They can also be called back to work at school for half of their holidays (FACT). And if the weather is good, I will jog in the morning from about 6-7am. Give me a text/call if you're in town! Let's catch up during CNY! You're also more than welcome to join me in the morning!